The firm is currently representing numerous clients from around the country in Actos lawsuits. If you believe you have developed bladder cancer or other drug side-effects contact one of the attorneys at Wright & Schulte LLC by calling 1-800-399-0795 or visit http://www.yourlegalhelp.com for more information. Actos, generically known as pioglitazone, was approved by the U.S. Food & Drug Administration (FDA) in 1999 to treat Type II diabetes. In June 2011, the FDA warned that patients taking Actos for more than one year may be at an increased risk of developing bladder cancer. The FDA issued the warning after reviewing a study in 2010 that was conducted in France and focused on 1.5 million diabetic patients who were followed from 2006 to 2009. The study found a statistically significant increase in the risk for bladder cancer in males who took pioglitazone compared to other patients exposed to other drugs that treat diabetes. As a result of the study’s findings, France suspended sales of medication containing pioglitazone and the FDA said that Germany recommended that new patients should not be started on pioglitazone. While Actos sales were not suspended in the United States, the FDA recommended to healthcare professionals that patients with active bladder cancer and those who had a history of bladder cancer should not use pioglitazone. Court records indicate that Actos lawsuit flings are mounting in multidistrict litigation in the U.S. District Court for the Western District of Louisiana (In Re: Actos (Pioglitazone) Products Liability Litigation-MDL 2299). The 3,672 pending Actos complaints have been consolidated in the Louisiana federal court for pretrial proceedings under the supervision of U.S. District Judge Rebecca F. Doherty. 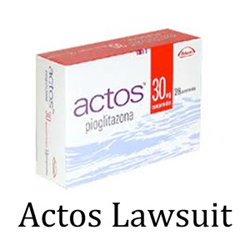 All of the Actos lawsuits were filed on behalf of individuals who allege one or more serious side effects, including bladder cancer, heart failure and liver problems as a result of using Actos. Court records further indicate that the first trial for an Actos bladder cancer lawsuit filed under MDL 2299 was held in April in the Western Louisiana federal court. The jury ordered Takeda Pharmaceuticals USA Inc. and Eli Lilly & Co. to pay a combined $9 billion in punitive damages to a New York man who alleged in his lawsuit that he developed bladder cancer as a result of taking Actos since 2006. (12-cv-00064) The jury found that the companies did not disclose the bladder cancer risk associated with using Actos. Bloomberg reported that the companies appealed the $9 billion verdict. In August, Judge Doherty, who presided over the jury trial, upheld the $9 billion verdict and said in her 101-page opinion that the jury “properly considered evidence” that showed officials from both companies knew about Actos’ link to bladder cancer and did not disclose that information to doctors and their patients. According to data compiled by Bloomberg, this is the second-largest jury verdict in the U.S. in 2014. Wright & Schulte LLC, an experienced personal injury firm, is dedicated to the belief that America’s legal system should work for the people. Every day, the attorneys of Wright & Schulte LLC stand up for the rights of people who have been injured or wronged and fight tirelessly to ensure that even the world’s most powerful corporations take responsibility for their actions. If you’re looking for a law firm that will guarantee the aggressive and personal representation you deserve, please do not hesitate to contact Wright & Schulte LLC today. Free Actos lawsuit case evaluations and other harmful drug lawsuit evaluations are available through yourlegalhelp.com or by calling 1-800-399-0795.